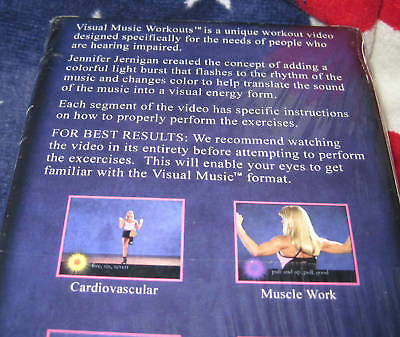 Visual Music Workouts with Jennifer Jernigan. The videotape that is designed specifically for the needs of people who are hearing impaired. Jennifer Jernigan created the concept of adding a colorful light burst that flashes to the rhythm of the music and changes color to help translate the sound of the music into a visual energy form. Each segment of the video has specific instructions on how to properly perform the exersices.